"I've been on the road for 50 years," said Miller, 71. A person with knowledge of the move told The Associated Press that Paul Azinger will replace him at NBC and still be in the tower for Fox Sports for the U.S. Open and U.S. Women's Open. The person spoke on condition of anonymity because NBC has not announced the decision. Miller figures to be a tough act to follow, in part because of his longevity, mainly because no other golf announcer said what he saw without worrying what the players might think of him. It was Miller who first talked about "choking," a word that had been taboo in golf broadcasting. "I get this every time I go through the gallery: `Keep telling it like it is,'" Miller said in a telephone interview. "I think people are starving for honesty and the real deal. I don't do it on purpose. That's the way I view golf. I was always tough on my own game. I was tough on myself when I choked or had the yips. That's just the way I viewed it. "I'd also be the first to tell you I was playing good, too." 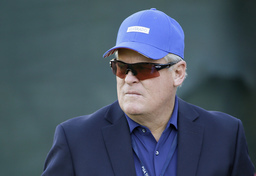 NBC is televising the Phoenix Open next year because CBS has a conflict with the Super Bowl. Miller felt that was the perfect time to sign off as the full-time analyst. He was known as the "Desert Fox" for his eight PGA Tour titles in the desert, six of them in Arizona. He still considers 1975 to be the best golf he ever played - the best golf he ever saw. Miller won the Phoenix Open by 14 shots, and the following week he went to Tucson and won by nine shots. "When I got there (Tucson) on Tuesday, I said I was going to win. Nobody said that back then," he said. "I was so on right then. I was really feeling great. That was the prime of my career. It didn't last long." He made another prediction years later from the broadcast booth at Pebble Beach for the 2000 U.S. Open. Four holes into the championship, Miller recalls saying about Tiger Woods, "He's not only going to win, he's going to win by a record score." "I walked around the course a little with him the day before," Miller said. "He had it." He once said of Justin Leonard at the 1999 Ryder Cup as Leonard and Hal Sutton were losing in fourballs, "My hunch is that Justin needs to go home and watch it on television." The next day, Leonard made a 45-foot putt that capped an American rally to win. One year at Doral, he said Craig Parry's swing would make Ben Hogan puke. Parry ended that event by holing out with a 6-iron to win a playoff. Miller made his debut with NBC at the 1990 Bob Hope Classic and wanted to quit after the first show because he was uncomfortable. By Sunday, he recalls mentioning a chance for someone to "choke," and he was off and running. "I never imagined going into a 30th year," Miller said. "The early years, being tough on players, I thought I shouldn't be doing this. I couldn't help myself. It's not easy to not make everyone feel great. I called it the way I saw it. I'm sure they probably didn't like it too much. I just did it because that's what happened."